Steve and Lesley have been in the sport of purebred dogs for 30 years and have a small hobby kennel situated in the heart of the Niagara countryside. 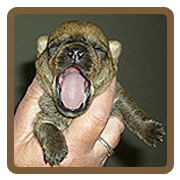 Our dogs are raised in the home with puppies underfoot. We first began breeding and showing Rottweilers and won consistently at US Specialties including winning Best of Breed at Regional Specialties. We took a break to raise our 3 children and while on a family trip we acquired our first Miniature Pinscher as a pet. We fell head over heels in love with Chi Chi and so it goes we have now been breeding Min Pins for 8 years and winning quite well both sides of the border. Lesley has always been enamored with terriers as she was raised with them while growing up in England. We acquired our first Norwich Terrier, a black and tan, Am/Cdn Ch. Foozle's Steel Magnolia and almost 4 years later Lesley also fell in love with the Norfolk Terrier and acquired her first female puppy, Ch. Avalon Razzle Dazzle. Copyright (c) 2011 www.rexrothkennel.com. All rights reserved.